Necrotizing vasculitis is a group of disorders that involve inflammation of the blood vessel walls. The size of the affected blood vessels helps to determine the names of these conditions and how the disorder causes disease. Necrotizing vasculitis may be the primary condition such as polyarteritis nodosa or granulomatosis with polyangiitis (formerly called Wegener granulomatosis). In other cases, the vasculitis may occur as part of another disorder, such as systemic lupus erythematosus or hepatitis C.
The cause of the inflammation is unknown. It is likely related to autoimmune factors. The wall of the blood vessel may scar and thicken, or die (become necrotic). 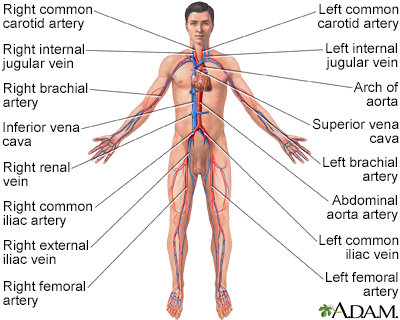 The blood vessel may close, interrupting blood flow to the tissues it supplies. The lack of blood flow will cause the tissues to die. Necrotizing vasculitis may affect any blood vessel in the body. Therefore, it can cause problems in the skin or any other organ. Fever, chills, fatigue, arthritis, or weight loss may be the only symptoms at first. However, symptoms may be in almost any part of the body. The health care provider will do a complete physical exam. A nervous system (neurological) exam may show signs of nerve damage. Corticosteroids are given in most cases. The dose will depend on how bad the condition is. Other drugs that suppress the immune system may reduce inflammation of the blood vessels. These include azathioprine, methotrexate, and mycophenolate. For severe disease, rituximab (Rituxan) may be used. Another choice for severe disease is cyclophosphamide (Cytoxan). The outcome depends on the location of the vasculitis and the severity of tissue damage. Call your provider if you have symptoms of necrotizing vasculitis. Habif TP. Hypersensitivity syndromes and vasculitis. In: Habif TP, ed. Clinical Dermatology. 6th ed. St Louis, MO: Elsevier; 2016:chap 18. Hoffman GS. L52. Vasculitis treatment: is it time to change the standard of care for ANCA-associated vasculitis? Presse Med. 2013;42(4 Pt 2):643-650. PMID: 23474045 www.ncbi.nlm.nih.gov/pubmed/23474045. Jennette JC, Weimer ET, Kidd J. Vasculitis. In: McPherson RA, Pincus MR, eds. Henry's Clinical Diagnosis and Management by Laboratory Methods. 23th ed. St Louis, MO: Elsevier; 2017:chap 53.